Gutter Installation. If you’re restoring an old home or building a new one, make sure that it has a durable and well-performing gutter system. This helps keep your home dry and damage-free. Because it channels rainwater away from its foundation and exterior walls, your home’s structure remains intact. Huff ‘N Puff can help you with this. We offer heavy-gauge aluminum seamless gutters that will suit your home perfectly. They reduce the potential for leaks and clogs, ensuring years of trouble-free performance. Gutter Replacement. Age and extreme weather can be harsh on your gutter system, causing it to fail. Before it compromises your home’s look and feel, turn to Huff N’ Puff. We have newer, sturdier replacement gutters that can deliver the reliable draining performance you’ve come to expect. Our seamless systems come with an exclusive SnapLock™ attachment system. This feature eliminates water intrusion routes made by gutter spikes and screws. Our seamless gutters are also available in a range of lovely colors to better match with your home’s distinctive look and style. Additionally, they come with a double warranty protection covering both materials and installation. Gutter Protection. As a premier home improvement company, Huff ‘N Puff carries only the best products available today. That’s why we exclusively use Gutter Helmet protection systems for this service. This exceptional product has a patented nose-forward design that allows rainwater to flow unhindered through the gutters. At the same time, it repels leaves, pine needles, and other loose debris so they fall harmlessly to the ground. This prevents clogs, which eliminates the need for regular gutter cleaning and maintenance.Because Gutter Helmet maintains your system’s draining performance, it also helps extend its lifespan. Some of the other features included with this product include: fade-resistant PermaLife™ finish for increased curb appeal; reinforced aluminum alloy brackets that keep the system firmly in place; and solid lifetime warranty covering material and product performance. Make the most of your gutter installation by augmenting your new system with our Gutter Helmet protection system. Heated Gutters. Reduce the possibility of ice buildup on your gutters by investing in Helmet Heat. If you have Gutter Helmet installed on your home, we can upgrade it with this system to ensure it remains sturdy and intact under freezing temperatures. Because these heated gutters melt ice and snow before they cause damage, you no longer have to worry as much about interior leaks and water damage to roofing materials. 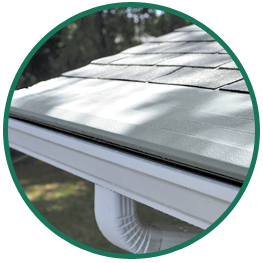 Keep your gutter system in top form all year round by turning to Huff ‘N Puff. As your trusted home improvement company in Westchester County, we’ll make sure you can get the most of your system’s life and performance. Call us today at (855) 483-3678 or fill out this form to schedule your consultation.